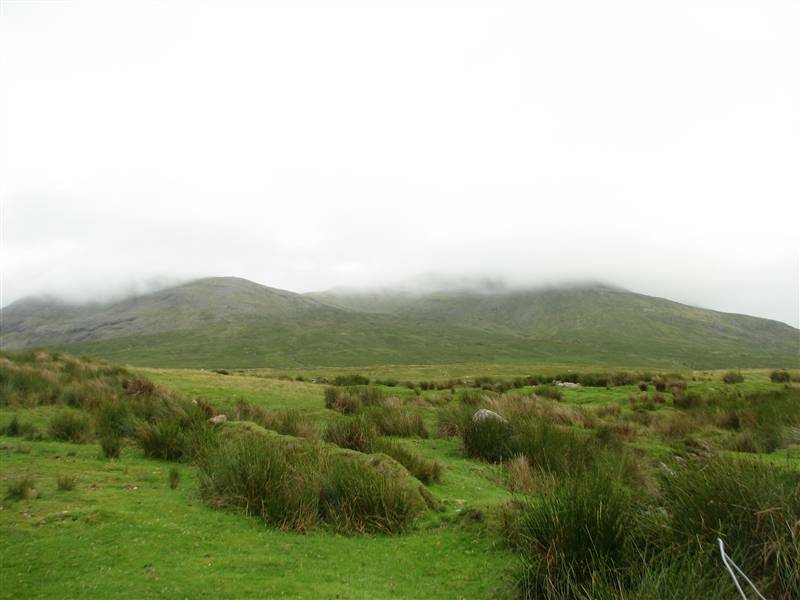 Mweelrea is the highest mountain in both Mayo and Connacht. Standing at 814 meters the peak offers panoramic, nay dramatic, views of surrounding mountains as well as The Sheffry Hills, the Twelve Bens, Killary Harbour, Croagh Patrick and some of Mayo’s finest beaches. With all these wonders on offer you’ll not be surprised to learn that these vistas are not given lightly, but are earned no matter what direction you approach this sometimes forbidding mountain from. Together with two friends I climbed Mweelrea from the relatively easier Western side. Note: For driving direction to Mweelrea you can click on the map above and select ‘Directions’. The map will then open in a larger format and allow you to specify your start point. While researching walking routes for Mweelrea – through a combination of guide books and comments on Mountainviews.ie – I came to the conclusion that approaching using the ‘classic’ route which involves starting from Doo Lough or Delphi and tackling “The Ramp” sounded a little too hairy for my liking. Phrases like ‘I had my heart in my mouth’ and ‘A rope may be required’ turned me off bringing two friends up this route without having experienced it for myself in advance. Whether or not the route is actually as exposed and unnerving as some accounts would suggest is something I’ll just have to find out some other time. 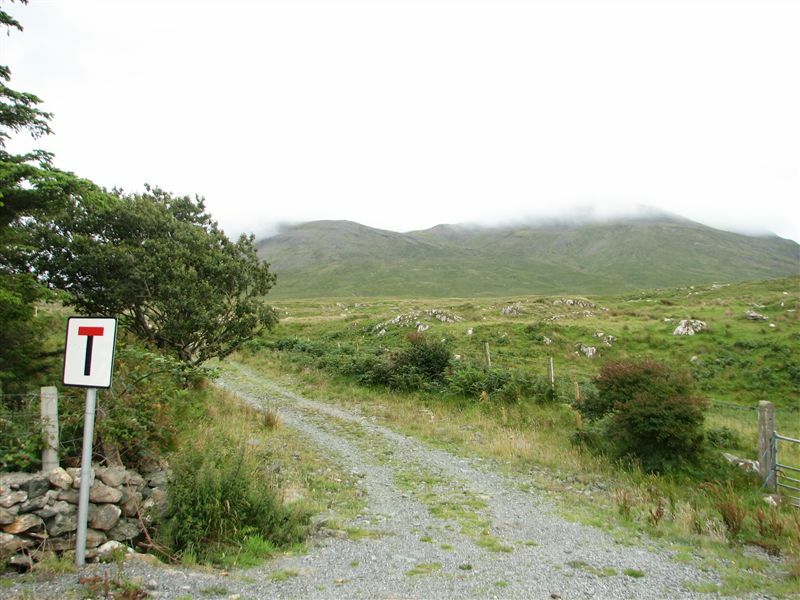 Have you walked Mweelrea using this route? I’d love to hear your thoughts. With that in mind I chose to approach from the West, a walk which is a lot less dramatic but still offers views of the dramatic ridges that more hardy walkers will have crossed to reach the saddle between Benbury and Mweelrea. Driving from Louisburgh we followed signs for the wonderful Silver Strand beach before parked up at a lay by just past a pink house at Dadreen [L687762], just a minute or two before the road ends at the beach itself. From here a couple of minutes walking up a rough track that parallels a stream will see you through a gate and into the open hillside. At this point you should be able to see the col between Ben Bury and Mweelrea just to the right of straight ahead. We headed towards the col, making steady progress through the boggy grass until one of our party noticed that his sunglasses were missing. This was about two minutes after we had stopped to admire some of the numerous frogs that are living on the hillside, so we backtracked as best we could and searched for about twenty minutes. Unfortunately, the featureless grass and heather gave us little to reference and we had no luck. Dammit, if only we had littered during our stop we probably would have been able to find the glasses! Having marked the general area with our GPS we pushed on, gradually veering to our right until we met a stream which has etched a channel for itself into the hillside. We crossed this at around 350 meters and followed it on up towards the col.
At around 550 meters the ground steepens for the final rise to the col. We could have altered course to the left to take a slightly easier route, but being three guys we bulled our way up the steeper ground for 5 – 10 minutes to emerge about 30 meters or so above the central section of the col, around point [L794674]. A moments walk further towards the East opens up spectacular views down towards Delphi and around towards Ben Lugmore which was for the most part covered by cloud but occasionally cleared to show its jagged ridge. After a break for lunch we pushed on towards the summit which was in cloud. It took just a few minutes to reach the cairn from the Col, with the ascent looking more difficult than it turned out to be. With no sign of a break in the clouds we didn’t loiter at the top and instead retreated back to the saddle for another cup of coffee. We had considered venturing up Ben Bury and out towards Benlugmore but with little prospect of being able to see down from these heights due to the clouds we opted instead to head for home. We stopped for a half hour or so to search for the missing sunglasses (without success) before strolling back down to the car and off towards Westport for a well-earned meal. Mweelrea was my 19th county highpoint of 26 I plan to walk this year. It’s a mountain I’d love to walk again, next time approaching from Doo Lough. Mweelrea and surrounding mountains BenBury and Ben Lugmore get plenty of attention on mountainviews.ie where there are lots of accounts of walking routes people have used. 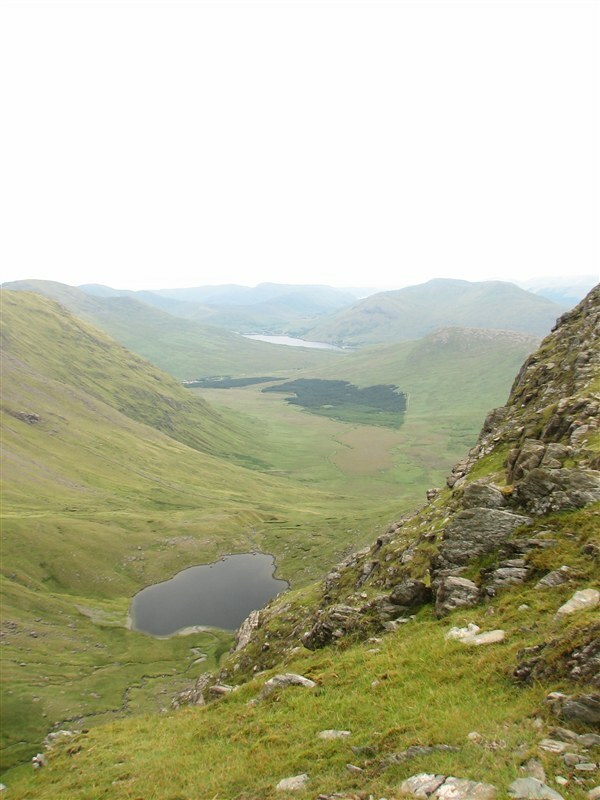 Routes up the mountain are also described in Paddy Dillon’s Mountains of Ireland and Joss Lynam’s Best Irish Walks. thank you so much for the information. Trekked Mweelrea yesterday in beautiful, clear sunshine and enjoyed fabulous views from the top. Followed your very clear directions exactly. Kept an eye out for the glasses but I’m afraid no luck. Thanks again for all the information you posted. I’m hoping to do Slieve Donard in the next few days and follow that up with Lugnaquilla and finally Carrauntoohill – Killimanjaro in late September. I’m delighted you enjoyed your walk up Mweelrea and got a good day for it. Slieve Donard and the others you are planning won’t dissapoint either I’m sure. (Donard and Lug are covered on the blog – I have yet to get down to Kerry) Best of luck with Killi, I’d love to try it someday. I hiked Mweelrea at the end of April using the directions on your blog. They were a great help and we found our way to the top without a problem. Even though it was a bit muggy the views were still great from the top. Would love to try it from the more challenging ‘classic’ route the next time so please cover that route in your blog too! Delighted to hear you enjoyed your walk. Mweelrea is a great mountain. I’ll certainly write up the other route if and when I get an opportunity to tackle it. On the 2nd attempt we succeeded today the 11th March 2012 from the North West but I found it tough, very slippy and steep. I have to say I am not impressed with my Walking boots (bought from a well known German Supermarket chain) – no grips worth talking about. I found myself clambering on all fours for much of the last quarter, ditto on the descent. It took us 2.5 hours as against 1.45 hours on Slieve Donard 2 weeks ago. One thing that shook me slightly was getting to the top, proceeding forward to determine how far this “plateau” extended to suddenly discover that I was looking over the edge that descended for God knows how far – it was misty. The other thing to look out for are the ravines that split the peals on the North Western side. Curiously the top was almost devoid of vegetation. This left the surface very slippy as I discovered very soon. All in all, glad to have done it, pity about the lack of sunshine (despite the high pressure system) and new boots on the shopping list. Beautiful par of the country. My own boots are starting to lack grip in wet conditions, I know it doesn’t inspire confidence on steep ground. Given the weather it sounds like you’ll have to go back to Mweelrea sometime soon, those views are worth seeing! Guess what? Go to http://mountainviews.ie/summit/34 and someone found a pair of sunglasses. AND if they are not the right ones, well these are a good pair and I think your friend deserves them. And if the dates aren’t right, then I suggest you can keep them yourself as you have been instrumental in finding them. Good luck! I just did Mweelrea from the Ramp approach and descended the same way you went up, down to Silver Strand (my friends dropped me at Doo Lough and I met them at the strand). A lovely day’s walking. The Ramp is certainly a slog, but has no real technical difficulties. There is about 20 yards right before the col where the path goes over rock but the rest is just steep grass. When you get to the base of the ramp, on the left side of the corrie as you’re looking from Doo Lough, you actually see two parallel ramps rising to your right, one lower and one higher, separated by a low but steep ridge with some crags. It’s best to continue until you’re on the second, higher ramp, before turning right and following it up around the back of the corrie. 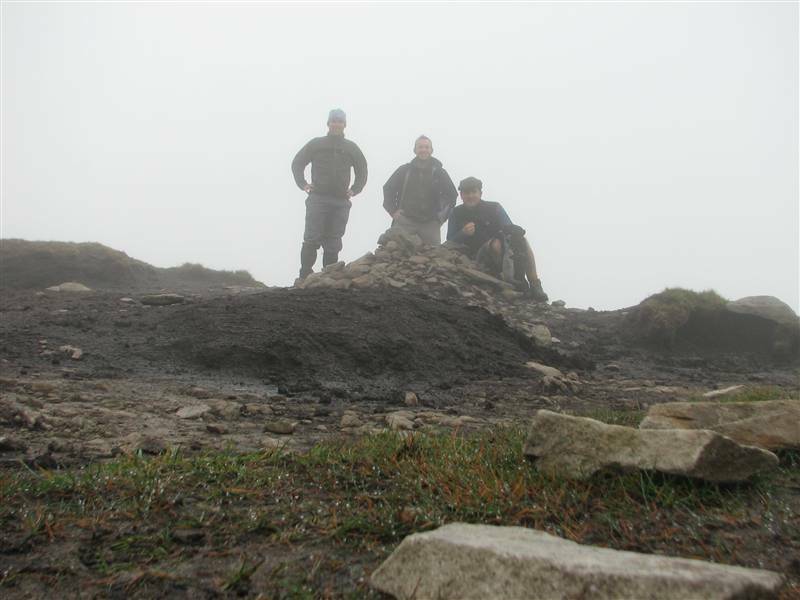 In mist, the bowl shape of the corrie will mean your bearing is changing continuously, from roughly east at the bottom of the ramp to nearly north at the top. I had a lovely sneaky dip in the Bunanakee River (as it’s marked on the OS map), on the way down the western side, just before the gradient becomes less steep – theres a deep hollow just before a left hand bend with a concealed waterfall of about six feet, a lovely little plunge pool and a sunny (in the afternoon) grassy bank for drying off. And the silver strand is a stunning end to the walk and the perfect spot for lying in the sun, finishing the last of a flask of tea and waiting for the faffers who thought you’d be down two hours late. It’s a beautiful range and next time I’ll do the full horseshoe from Delphi, but I suspect the ramp route is the most spectacular way up. Sorry, that should be roughly West to roughly North at the end of the 1st para. And of course, congratulations on your feat (or should that be to your feet!). Hi Murray, My sentiments precisely though having only viewed it from both sides (see blog). I hope to return soon to climb it but wouldn’t do it on my own. Hopefully I can accompany someone who knows Mweelrea a lot better. You might be can be a excellent site owner. Your website filling velocity is remarkable. Them almost feels that you’ll be performing almost any exceptional strategy. What’s more, Your belongings are usually work of genius. you’ve done an incredible activity with this subject! Hi Murray, I will be travelling to Mayo again in July and have always wanted to climb Mweelrea. Despite having climbed Croagh Patrick 4 times and Nephin Beg once, I am something of an amateur. 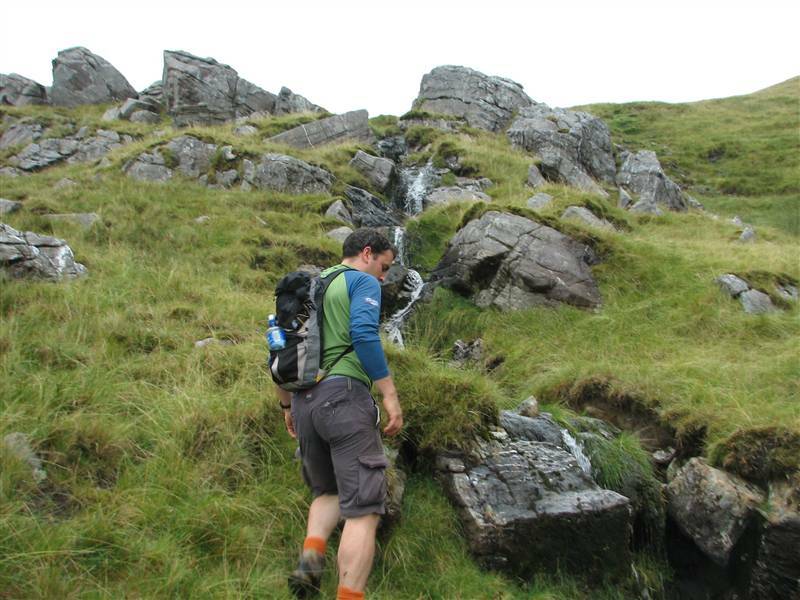 Do you think it would be possible for me to climb Mweelrea with the route you took or should amateurs stay well clear? Hope to hear from you soon. Many thanks, Tom. The route I took up Mweelrea is as straighforward as it gets for this mountain and in fair conditions should be entirely manageable. However, all the usual safety precautions should be taken and the steep ground presented by the mountain noted. If clouds come in while you are on the summit you need to be confident you can safely find your way down. Unlike Croagh Patrick, there is no well trodden route to follow so you will need to be navigationally self-sufficient. Great blog you have here Murray, thanks very much for all the generous, very clear & concise information. I did the Focus Ireland fund-raiser 4 Peaks last weekend, (Carauntoohil/Mweelrea/Slieve Donard/Lug, in that order) and am only sorry I hadn’t found your blog prior to our walks, although of of course on our days there were 100+ other walkers, and dozens of Focus volunteers, on the slopes to guide and support us, so the requirements for real navigation skills were minimal, to be honest! Still great to stumble across your blog as I hope to make getting out on the hills a more regular event now in future. I’m thinking of posting up my own, very amateur experience on my own WP blog. If so will assuredly include a link to your excellent blog here, really first class resource. One last thing, saw earlier, on Twitter, there’s an organization called Hill & Walk Ireland, looking for writers. Obviously you’d be ideal and would have content ready to go. So I posted a link to your site here, onto their Twitter a/c earlier. Anyway, I imagine they would be thrilled to hear from you, if you were interested in dropping them a line. Great blog! I’m planning on hiking up Mweelrea on Sunday so pleased to find this info 😀 hopefully the area hasn’t changed dramatically in 4 years and I can find the way! Hi Murray. Thanks for the report. It was good of you to show the picture of the start. Paul Phelan’s book gives a GR for a spot further up the road? But I worked out that way myself – just today as it happens in glorious sunshine. Crikey what a beautiful mountain! The views from summit were best I have ever seen. In reference to ‘the ramp’ approach, which I did to Ben Lugmore on a separate outing, it is as another said fairly straightforward. There is however one short pinch point near the top. The narrowest of paths is etched into a steep scree bank but for about 8 or 10 paces is sloping and has loose gravel on it. I was fearful of the gravel giving under me as I treaded my way across. Perhaps a walking stick would help but so unsettled was I by it that I elected for the more straightforward route you described above on this visit. Ben Gorm tomorrow, can’t wait! I think you may have the first grid reference, for your parking spot, the wrong way round. Should read L762687 instead of L687762, though I’d be impressed if someone managed to park 6km off the coast, about halfway out to Inishturk!